I recently wrote that I was off to Royal Ascot this year and in need of morning tails. In fact I’ve hired the jacket and trouser but what I looking to buy was a double breasted buff waistcoat. In just such a circumstance many London men head to David Saxby’s shop Old Hat. A wonderful vintage emporium located in Fulham, just across Putney Bridge, it’s renowned for high quality vintage evening dress and formal wear. They also have an unrivalled collection of vintage Savile Row Tweed jackets and suits. I’m a fan of vintage and own just one Savile Row suit. It fits me like no other garment I own, and comes courtesy of Old Hat. It always amazes me just how many men known of Old Hat, and how many who still don’t. For one thing the shop is beloved by the men who frequent it, and it doesn’t attract your average vintage crowd. Many aren’t by nature what you’d call thrifters. But there is something about Old Hat which means once you step inside its hard not to find yourself coming back. For most men that first experience starts with morning tails. In fact enter the premises on any Saturday between May and September and you’d find it hard to move for grooms to be, best-men pending and other honoured guest. But Old Hat is more than just a great place to go to get around a potentially expensive social life. If anything it’s a celebration of classic dressing, an age of craft and quality. Supplying everything from stiff collars to riding boots, Old Hat is about the vision and dedication of one man with an extraordinary love of clothes, the legendary David Saxby. To many he will need little introduction, being the sartorial agony uncle on that wonderfully English, wonderfully eccentric publication The Chap magazine. Sadly when it came to my double breasted waistcoat Old Hat had already been cleaned out by Ascot goers, but any excuse to visit Old Hat should be indulged. Believe me, Andrew, it’s not just Ascot – it almost never has any in. If you enquire, they will send you next door and sell you a new one for £150. Personally, I always find Old Hat just slightly disappointing. Perhaps it’s unfair of me to say so, but the one drawback of a vintage shop owned by someone who really knows about what they sell is that as a shopper you know that your chances of finding an unappreciated gem are very slim indeed. It takes all the fun out of it. 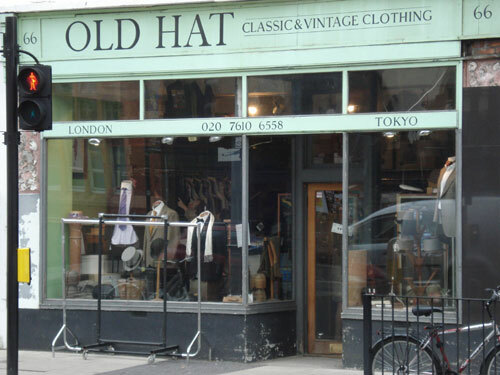 Old hat has a good, but expensive, range of suits, while the genuinely unusual items like top hats or double breasted waistcoats are in short supply and eye-wateringly pricey. Just my opinion, of course. It’s still a cool shop, and I go every so often, but have never yet bought anything. Was taken there for the first time by my Pa in 1997 I think. Still go back every time I’m in London. Next door in ‘David Saxby’ they have a great line of m2m tweeds. Fantastic service and very knowledgeable staff, it isn’t cheap because the stuff is well made from decent fabric – you get what you pay for. I just got a buff double breasted waistcoat for a wedding, and a new pair of cashmere strip trousers. Erm.. sorry about the waistcoat! I do however agree with the coment above – you have to be lucky or of an unusual size to find a real gem, because the best bits get snapped up quickly. Not their fault though, keep on going back and one day you’ll be lucky too. Jake has definitely put his finger on it. Bravo. For a double breasted waistcoat of the type you want, I might suggest Ede & Ravenscroft, price around £125, I recall. Where would you find one in the states?